This year’s fair will also mark the last Basel fair for TAG Heuer CEO Jean-Christophe Babin, as he will soon depart to become CEO of Bulgari. 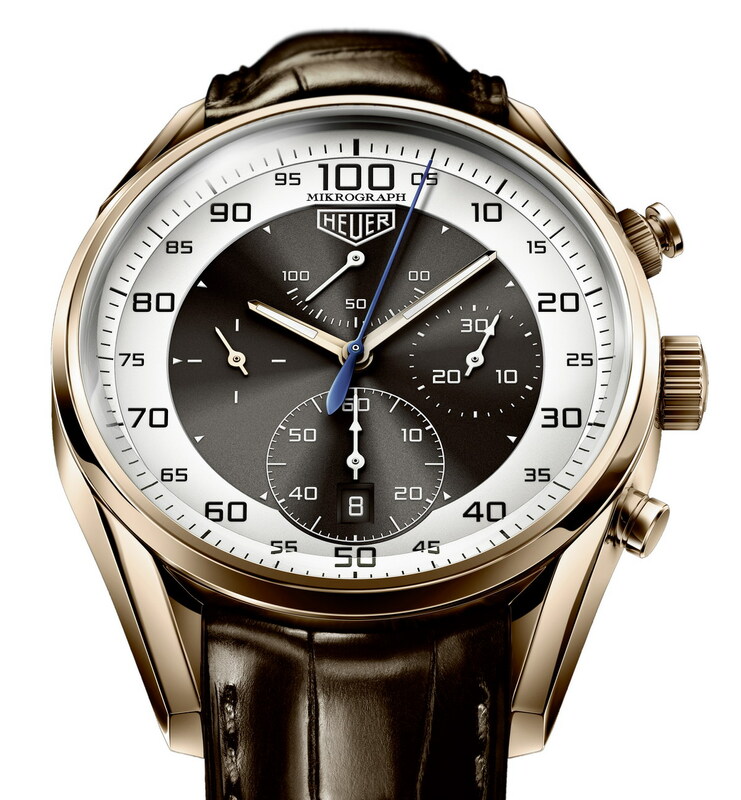 Since his arrival at TAG Heuer 13 years ago, Babin has focused on Heuer’s unique heritage in motorsports and its accomplishments in precision timing. 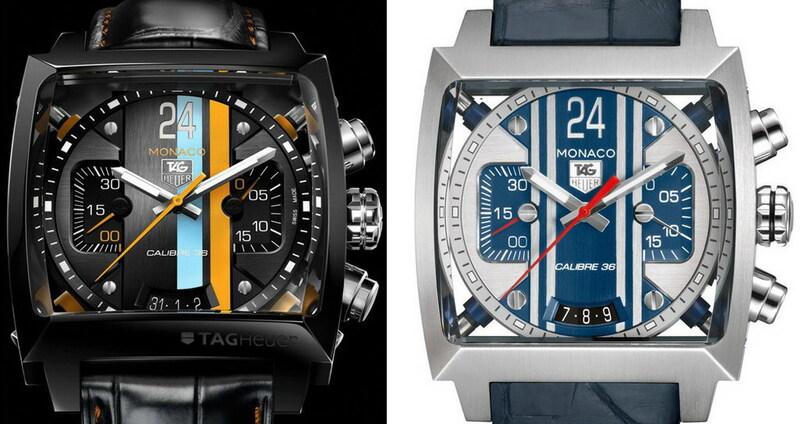 We can expect to see more of both these themes in the watches TAG Heuer will introduce at Basel. In the run-up to Basel, TAG Heuer has published “teasers” for two watches — or perhaps two series of watches. The first “teaser” (shown below) would appear to show this year’s version of TAG Heuer’s offering at the alter of Haute Horologerie. 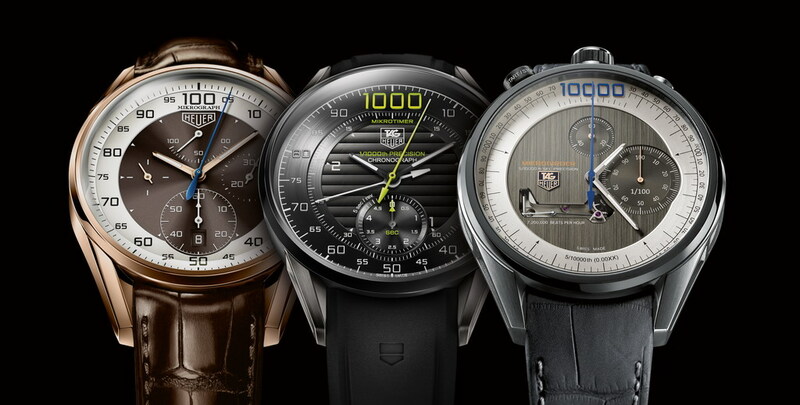 Just as TAG Heuer has used previous Basel fairs to introduce its Grand Carrera Pendulum (2010), Mikrotimer Flying 1000 (2011), MikrotourbillonS (2012) and Mikrogirder 10000 (2012), we can expect to see another amazing “concept” chronograph, that will showcase take TAG Heuer’s innovation and technical abilities, all in pursuit of extreme precision in timing. 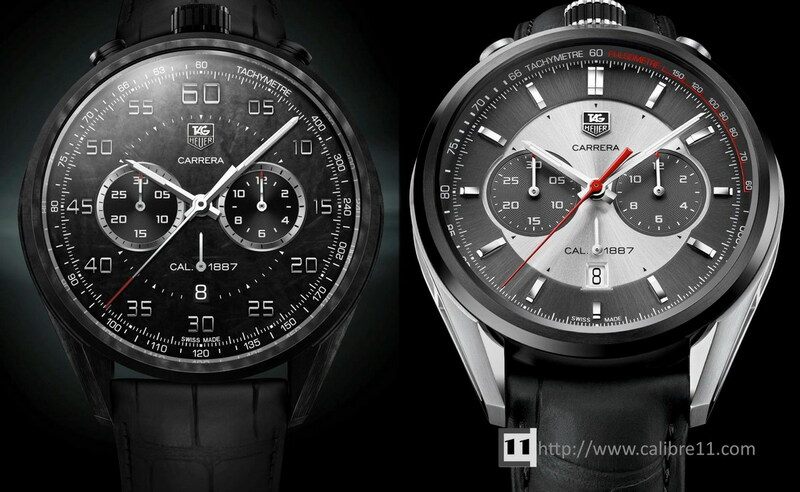 David, over at Calibre11.com, has done an excellent job analyzing all the tiny clues in this image, so rather than examining TAG Heuer’s new “concept” watch, let’s have a look at the Calibre 36 Carrera. Zenith introduced the “El Primero” movement in 1969, competing with the Heuer / Breitling joint venture to stake the claim to the world’s first automatic chronograph. While the debate about “who won the race?” continues to this day, one thing is certain: the El Primero was a beautiful movement and an important accomplishment. Whereas Heuer, Breitling, Buren and Dubois-Depraz developed a modular movement, the El Primero was an integrated movement, having a far more elegant design. With a beat of 36,600 beats per hour, the El Primero provided for 1/10 second precision, well ahead of the 1/5 seconds offered by the Heuer “Chronomatic” movements. When TAG Heuer’s parent — the LVMH Group — acquired the Zenith brand, in 1999, there was great excitement among many of the TAG Heuer traditionalists. Now that the legendary El Primero movement was “in the family”, surely the movement would make its way into some of TAG Heuer’s classics — specifically, the Carrera and Monaco, and perhaps even the Autavia. These Heuer models were the rivals of the El Primero back in 1969; we expected TAG Heuer be able to procure the movements for at least some of its current chronographs, combining the best of Heuer’s heritage with the best of Zenith’s watchmaking. Reviewing TAG Heuer’s use of the Calibre 36 movement since 1999 is a disappointing exercise. We see that while the movement has been used in a variety of TAG Heuer’s chronographs, the Calibre 36 has hardly been used in any chronograph that might be called part of TAG Heuer’s “mainstream”. If you want an El Primero movement in a TAG Heuer chronograph, your choices have been limited. Let’s review TAG Heuer’s Calibre 36 portfolio, to see exactly what is available to the enthusiasts who wants to purchase a TAG Heuer chronograph, powered by the Calibre 36 movement. We start with the Monaco 24 chronographs. Strong colors, amazing materials and finish, an innovative shock-proofing system and a peek through the display back confirms that there is a Calibre 36 movement powering the machine. If the Monaco 24 and the SLR might be a bit too radical, then perhaps you will like one of the Monzas that uses the Calibre 36. 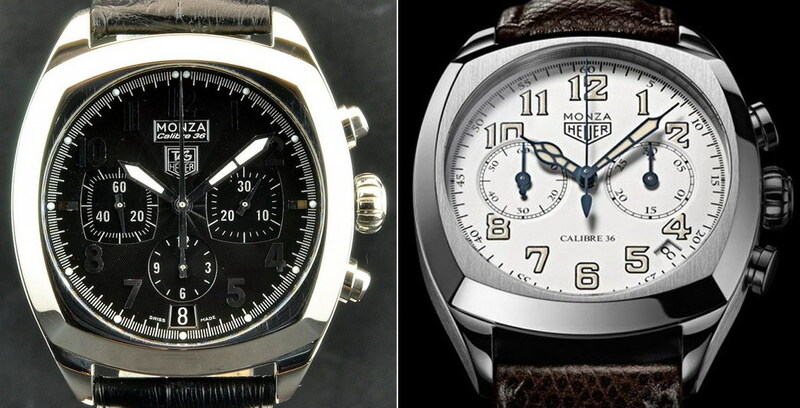 Both these chronographs have something of a “retro” style, evoking styles of the 1940s. But, of course, no portfolio of TAG Heuer chronographs would be complete without a couple of Carreras, so let’s have a look (below) at the Grand Carreras that use the Calibre 36 movement. These chronographs use a rotating disc system (RS), with the 1/10 seconds indicated by a linear system (LS). Amazing to consider that the same movement powering the calm, quiet looking Monzas is driving these beasts! And last but not least, you can have your Calibre 36 movement in the Link chronograph, with either a white dial or a black dial. No, the “Link” does not date to the 1960s, like the Monaco and Carrera, but these chronographs do have a fairly traditional layout, busier than the Monzas, but not quite as frenetic as the Grand Carreras. 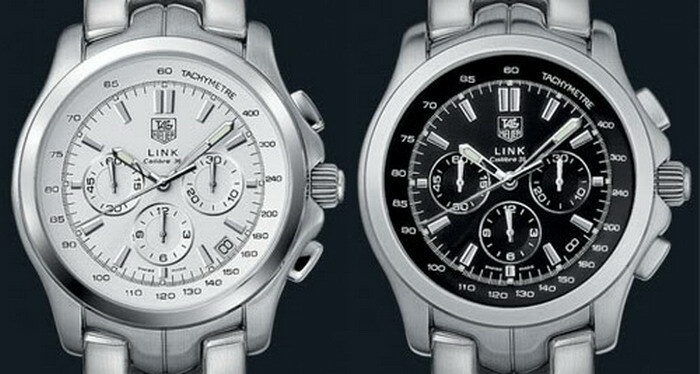 So what’s missing from the line-up of Calibre 36 chronographs from TAG Heuer, as shown above? The answer: A normal / mainstream / classic /conventional watch that will draw on the heritage of the Heuer brand and the mystique of the El Primero movement without shocking the senses. Yes, we have innovative materials, display systems and construction, but as we consider the nine Calibre 36-powered chronographs shown above, we might ask “which one is a simple, normal chronograph?” Well, you see, it appears that TAG Heuer has not been using the Calibre 36 movement for any such chronographs. What Can we Expect from the New Calibre 36 Carrera? 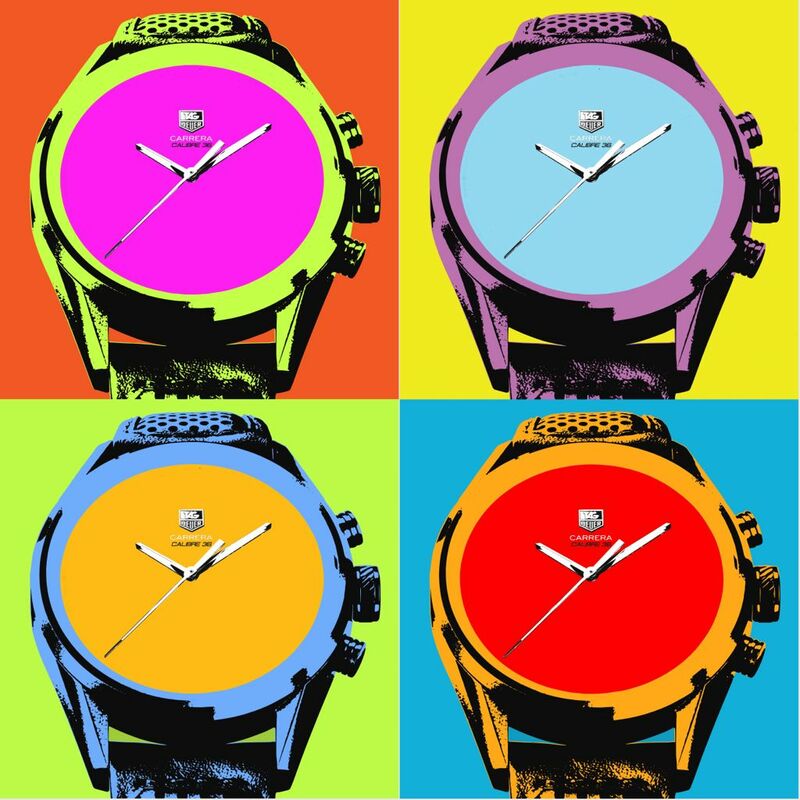 We start with the graphic showing four watches, done in the “Pop Art” style that TAG Heuer has been using a theme to celebrate the 50th Anniversary of the Carrera. Focusing on one of the watches, we can begin to look for some clues about what TAG Heuer will be introducing on Thursday, and perhaps reach some tentative conclusions. Two of the new Carreras introduced in Geneva, in January 2013, were “Bullhead” models, with the pushers and crown at the top of the watch. A quick glance at the Pop Art Teaser shows us that the new Calibre 36 Carrera will be a conventional arrangement, with crown and pushers on the right-hand side of the case. Perhaps we can assume that TAG Heuer used the “bullhead” arrangement when it wanted to rotate the Caliber 1887 movement to create a bi-compax design, but that they will use a traditional chronograph orientation for the Calibre 36 models, as the movement follows a bi-compax or tri-compax design, without being rotated. Why the Short Time-of-Day Hands? A quick glance at the Pop Art Teaser raises a question – why are the hour and minute hands so short, while the chronograph second hand appears to be the normal length? Can this have happened in TAG Heuer’s art department, and have nothing to do with the design of the watch, or do these short hands give us some information about the look of the watch? Reviewing some recently released TAG Heuer chronographs, we see that there are several that have this same style of short hands. All three of the “Mikro” series shown below have short time-of-day hands, with full length second hands. 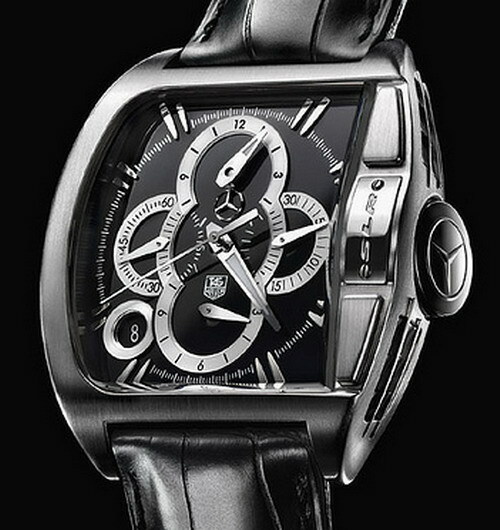 TAG Heuer uses this design for chronographs that are inspired by stopwatch designs, as shown on the Mikrograph (below). 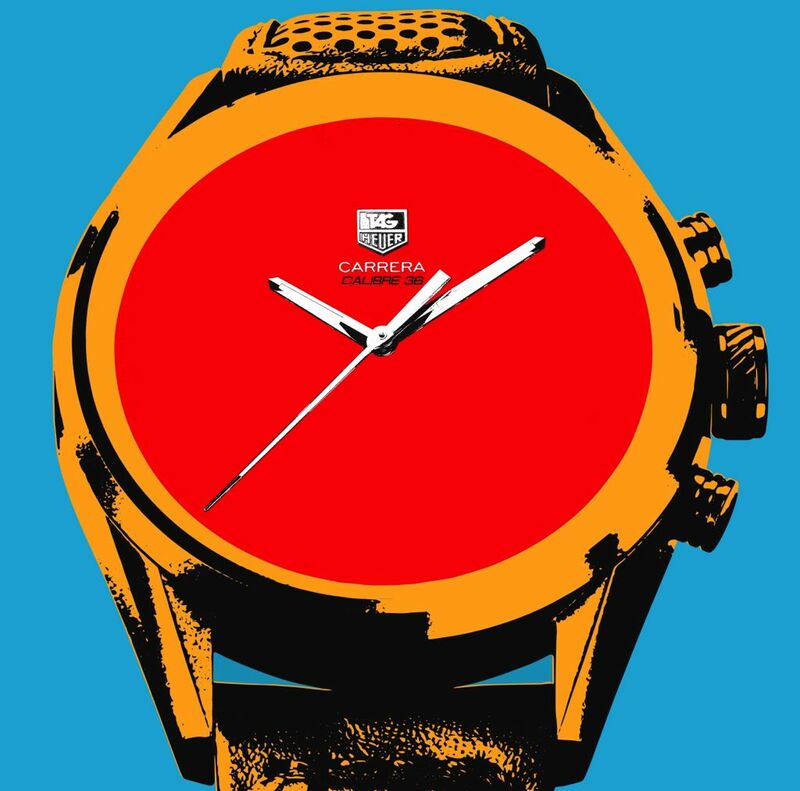 Thus the Pop Art Teaser suggests that the new Calibre 36 Carrera will have this same “dial-within-dial” design, with a seconds track on the outside of the dial and a time-of-day area inside this track. The “short hands” are used on the smaller dial within the dial. Shown below is the Carrera Mikrograph, which follows this approach. Will the Dial be Traditional or “Exotic”? Having concluded that the Calibre 36 Carrera will have a traditional chronograph orientation, with a stopwatch-inspired dial, we should consider whether the design of the dial will be traditional (like the Mikrograph shown above) or “exotic” (like the Grand Carrera shown below). While anything can happen with these “exotic” arrangements, it seems like a safe bet that the new Calibre 36 Carrera will have a traditional flat dial, with traditional registers. A quick survey of recently-introduced Carreras suggests that we can expect a traditional dial. 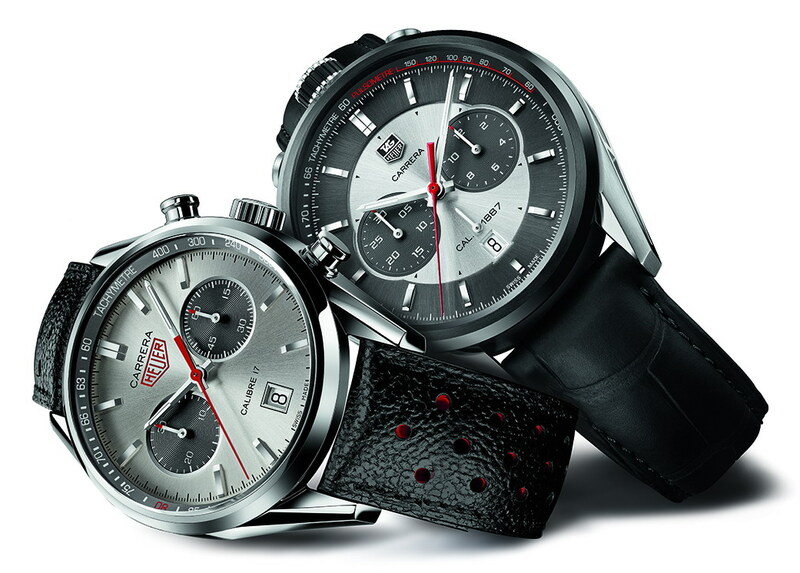 While vintage enthusiasts might think that any Calibre 36 powered chronograph will have three registers (to include an hour recorder), TAG Heuer’s recent use of the movement – specifically in the Monaco 24 and Grand Carrera Caliber 36 – suggests that TAG Heuer feels free to delete the hour recorder to suit the design of the watch. The Pop Art Teaser seems to suggest that the dial will have ample space for three registers, in a tri-compax arrangement, but given the dial-within-outer-track, stopwatch-inspired design, space may be tight. The Jack Heuer 80th Birthday Carrera, Jack Heuer 50th Anniversary Carrera, and Carbon Concept Carrera all suggest a current preference for bi-compax designs, so I would say that we should not count on the third register / tri-compax design. No doubt, the vintage enthusiasts will beg for this third register. 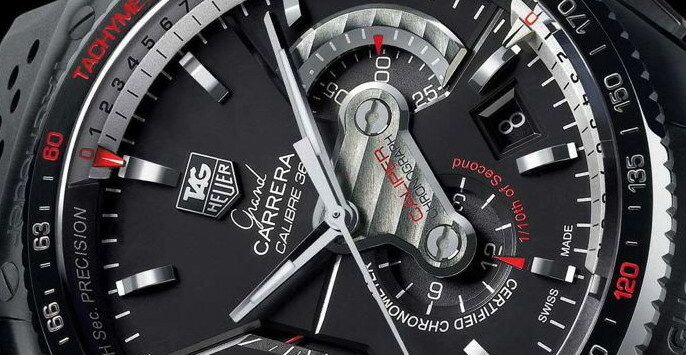 Recently-introduced Carreras have used a variety of materials, ranging from stainless steel for the Jack Heuer 80th Birthday Carrera, to black titanium carbide coating on the Jack Heuer 50th Anniversary Carrera to an “isotropic matrix of carbon fibers” for the concept Carrera introduced in January 2013. It’s difficult to hazard a guess about the Calibre 36 Carrera. For a model that will actually go into production, rather than being “for show”, the default setting would be stainless steel. And Why Is the Tip of the Chronograph Second Hand Painted Red? We know that Jack Heuer likes the red accents — as we saw on both the Jack Heuer 80th Birthday Carrera and the Jack Heuer 50th Anniversary Carrera – but I have absolutely no clue why the tip of the chronograph second hand is painted red. 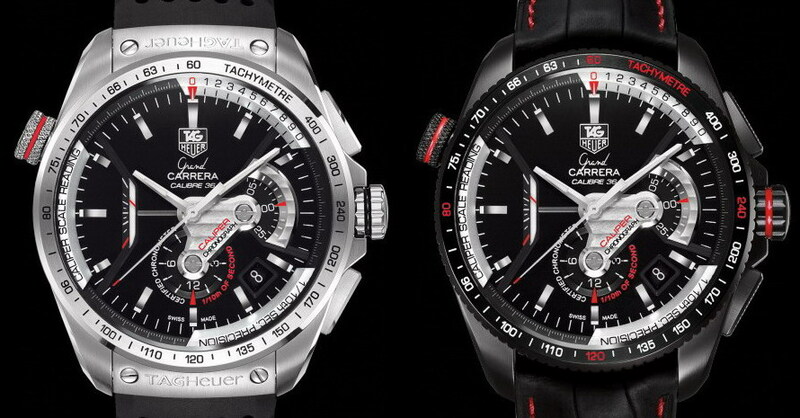 Will the new Carrera have the same type of red accents as the last two “Jack Heuer” models or might this red tip point to something else? I suppose we will have to wait until Thursday, April 25th, to learn about this piece of the puzzle. I have the sense that we have been waiting for the Calibre 36 Carrera for a long time. It’s been 50 years since Heuer designed the Carrera, 44 years since Zenith launched the El Primero, 17 years since the first re-issue of the Cararera, and 14 years since the El Primero movement came into the TAG Heuer family. Now, we are 36 hours away from seeing how the perfect design for a chronograph will be mated with one of the most brilliant movements in watchmaking history. It’s been a long time coming, with a few “bumps” along the way, but 36 hours before we will see the Calibre 36 Carrera, I am optimistic that we will come to consider Basel 2013 as the moment when this perfect design met this perfect machine.